The Quintet changes the entire tonal response of your pickups, altering their bass, mid and treble resonances in dramatic and highly musical ways. Quintet Tone Curve Board w/6-position Rotary Switch. 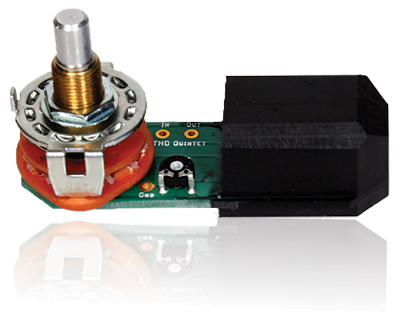 Passive module to be built into your guitar or bass that permits you to select among 5 different frequency response curves to be applied to your existing guitar sound. Also includes a 6th Bypass position. Only works with passive, magnetic pickups in guitars, steel guitars and basses. Greatly expands your tonal range. Download the full product specs to read more about the Quintet Tone Curve line of products. You will need Adobe Reader to download the full product specs, manuals and product reviews.